The dog relies heavily on its scenting powers and, of all of its senses, smell gets the final say. For example, if you placed a stuffed tiger in your living room, your dog would most likely bristle, growl or bark at first sighting. Its eyes would be relaying a message to its brain that this was a real threat. However, once it was able to sniff the tiger, it would soon realize that this creature was not alive, and a further message would be relayed to the effect that it posed no threat. Once this new message was received in the brain, the dog would probably ignore the tiger altogether. This is an invaluable exercise to teach your dog. You will probably use it regularly for finding articles you have lost such as dropped keys, wallets or even money. To teach your dog how to find objects, you will need a small wallet or glove that has your scent on it, a screw-top jar with diced meat or a special treat for the dog—preferably a food type that is not too soft, and therefore easy to handle. Place your dog in a “sit”, and walk out in a direct line in front of it until you are approximately 25 paces away. Then, opening the jar, take some food out of it and place it on the ground. Return to your dog, and command “Seek” over and over, gently leading it toward the snot where you left the food. Allow it to eat the food, praising it as it does. Repeat this process several times, each time extending the distance until eventually you are moving out of sight—say, behind a tree or a hedge—taking the food with you. If you go out of the dog’s sight temporarily, you will be getting the dog to start using its nose: if it cannot see where you placed the food, it will have to start sniffing the ground to find it. Once your dog has found the hidden food several times, start from the beginning again, placing the food close to your dog and then gradually moving it out of sight. But now you should be placing the wallet or glove you have with you next to the food, and getting your do to pick it up immediately after it eats the food each time. Praise your dog lavishly as it picks up the item, and then run backward toward where you first placed it in the “sit”. Now get the dog to bring the item to you. It is not absolutely necessary to go all the way to the exact spot, as long as your dog does get accustomed to bringing the item to you over some distance. Continue this until your dog is finding the food and bringing the object of its own volition. Once this happens, repeat the exercise again, but this time without leaving any food next to the object. Follow your dog to the spot, and as soon as it starts to look for the food, command “Seek,” and make sure that the dog picks up the article. Again, praise it and then run backward. This time reward your dog with the food on its return to you. Be sure to leave the unused food in the sealed jar; otherwise your dog will lose concentration as it looks for its treat. Keep control with your one-word reprimand if the dog starts sniffing around. Praise your dog for bringing the article to you, take the object, and then feed the dog immediately. Repeat this about five times more, and then discontinue using the food altogether. Then repeat this exercise over the next few days, again phasing out the food as soon as you feel your dog is enthusiastically seeking out the object. Be sure not to tire your dog by doing too many “seeks”— about four a day are sufficient after your introductory training session. 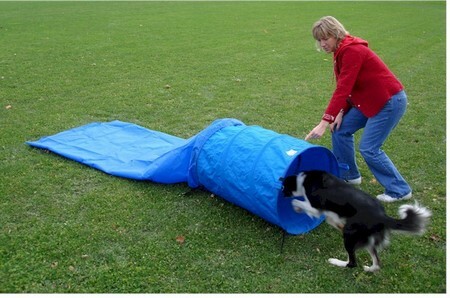 Your dog will become uninterested if the exercise starts to become tedious. After a few days, change the pattern by taking the dog with you, making it walk correctly by your side and dropping your article behind you while you are walking. Continue this exercise until your dog is confidently seeking out article you have dropped each time you practice. Change articles from time to time so that the dog becomes accustomed to finding all types of objects for you, and change the pattern you walk in also.